If the employee works more than five hours per day, they must get a meal break of at least 30 minutes. 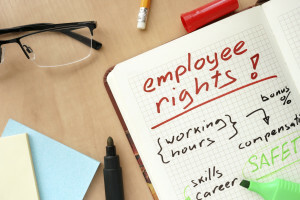 However, when a work period of less than six hours will complete the day’s work, the meal period may be waived by mutual consent of the employer and the employee. If the employee works more than ten hour per day, they must get a second thirty minute meal break. The employee must be relieved of all duty during they thirty minute meal period. Otherwise, it will be considered an “on duty” meal period that must be compensated at the employee’s regular rate of pay. “On duty” meal period requirements Under California Code of Regulations, Title 8, Section 11040: Unless the employee is relieved of all duty during a 30 minute meal period, the meal period shall be considered an “on duty” meal period and counted as time worked. Unless the employee is relieved of all duty during his or her thirty minute meal period, the meal period shall be considered an “on duty” meal period that is counted as hours worked which must be compensated at the employee’s regular rate of pay. When, by written agreement between the employer and employee, an on-the-job paid meal period is agreed to. The written agreement must state that the employee may, in writing, revoke the agreement at any time. The test of whether the nature of the work prevents an employee from being relieved of all duty is an objective one. An employer and employee may not agree to an on-duty meal period unless, based on objective criteria, any employee would be prevented from being relieved of all duty based on the necessary job duties. Some examples of jobs that fit this category are a sole worker in a coffee shop, a sole worker in an all-night convenience store, and a security guard stationed alone at a remote site. A second meal period of not less than thirty minutes is required if an employee works more than ten hours per day. However, if the total hours worked is at least 12 hours, the second meal period may only be waived by mutual consent of the employer and employee, and only if the first meal period was not waived. The employer must provide one hour compensation for every work day a meal break was missed, not for every time a violation occurred. If an employer fails to provide an employee a meal period in accordance with the applicable provisions of this order, the employer shall pay the employee one (1) hour of pay at the employee’s regular rate of compensation for each workday that the meal period is not provided, not for every violation. For example, if an employee worked 12 hours shift, and was not provided his 2 meal breaks, the employee should be compensated one (1) hour of regular pay for that workday, not (2) hours for the two times the meal break violation occurred. In addition, this additional hour is not counted as hours worked for purposes of overtime calculations.